At age 32, I wrapped up my life in New York in two weeks and moved in with Amin, my 30-year old brother in Seattle. I knew this day would come, but no one in my family had believed me. My longest standing gripe with my parents was that they had not enabled us to have a strong sibling relationship and that Amin and I were two strangers who grew up in the same house. Amin was diagnosed with muscular dystrophy (a degenerative condition for which there is no cure) shortly after his second birthday, but that never stopped him from reaching the greatest heights of independence and individual success. He was our “baby genius”. Amin graduated as salutatorian of his high school class, enrolled in the Management & Technology Program at the University of Pennsylvania (an Ivy League institution), earned two degrees in four years, interned at Google and Microsoft before accepting a full-time offer at the latter. Many of Amin’s friends didn’t know he had a sister. Many of my friends believed I was an only child. But we knew we couldn’t stand each other for more than a few hours at a time. Amin’s traumatic injury in October 2018 suddenly brought us together. I moved in after Thanksgiving, but with strict plans to move out in six weeks. On day seven, Amin asked if we could sign-up for sibling therapy. I enthusiastically agreed, mistakenly believing that I already knew everything about my childhood and that there would be no surprises this time around. Our therapist confirmed this family pattern by asking Amin to share something positive he’s heard our parents say about me. His silence was deafening and pierced straight thru my heart. I had learned to cope with the inconsistent emotional support from my parents, but being reminded of that reality plunged me back into the past, and my mind replayed my parents’ messages back to me: You are deeply flawed, can do nothing right, have made nothing of your life, and are a burden on this family. I could almost see the neurons rapidly firing in Amin’s mind. He fought hard to hold onto the belief that our parents are rational, reasonable people. He was convinced that there must be a valid reason for the all-negative picture they have painted of me. He brought up several instances to remind me of my ‘irresponsible behavior’ and reinforce our parents’ version of my life story – that I was inconsistent, unfocused, and undisciplined. We switch gears – I’m asked to share a memory linked to deep pain and vulnerability. I thought back to my wedding day – June 14, 2014, when our mother put her youngest sister’s preferences above mine and demonstrated that I wasn’t even second place (after Amin), but that I was last place in our family. My needs and wants didn’t matter, not even on my wedding day. When I experienced emotional abuse in my marriage only a few weeks later, I didn’t know what to do with myself. I didn’t know where to turn for support or who to trust anymore. I was gasping for air in a chamber of inescapable pain. I made one last attempt to reach out – this time, to Amin. I asked if he would let me come to Seattle and stay with him for a few days. But Amin wanted nothing to do with me. It was the last straw. No one was willing to take me in for a few days, to offer any comfort, to hold me for just a little while. I was abandoned with my pain, because of my pain. Less than an hour after that phone call, I attempted to end my life and relieve the world of this unwanted burden. Amin’s knee-jerk response: Wow, I feel like an awful brother. The therapist chimed in: Hold on a second – your sister is not sharing this to blame or attack anyone. Let’s see if we can practice empathy here. I want you to imagine what it must have felt like to be her in that situation, and just sit with it. How do you feel? Amin: Lonely, like no one understands. Therapist: Sabrina, would you agree that this is what you felt? I nodded my head. Amin (turned to the therapist): Why does this happen? Why would parents do this? 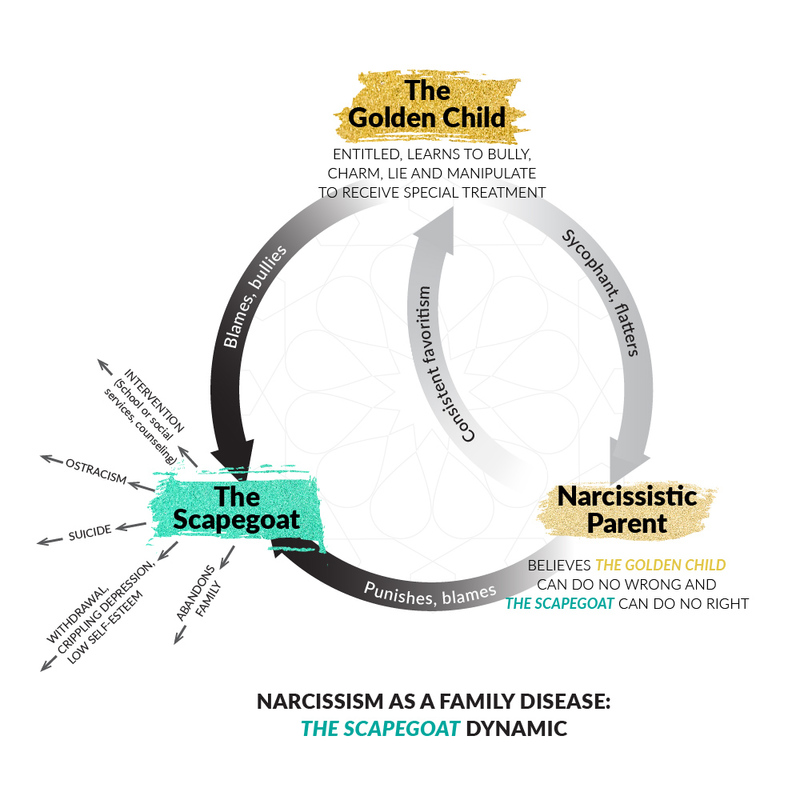 The therapist explained that the golden child and scapegoat pattern isn’t a conscious decision. The parents often blame the scapegoat for all their own shortcomings and childhood issues they haven’t worked through. Once they have a story in their minds, they repeat it over and over, which causes them to believe it even more strongly (repetition bias). They collect evidence to explain and support their distorted version of reality and ignore facts that undermine it (confirmation bias). In other words, they see what they believe – a black and white version of reality, which is inherently flawed. They convince other family members of the same distorted reality, including the scapegoat’s siblings. By controlling the narrative, they gaslight individual children to maintain power over the family as a whole. She continued: It wasn’t just the geographic distance in adulthood that separated the two of you; it is also a starkly different childhood despite having the same set of parents. So why did I move to Seattle? It was a combination of the scapegoat pattern playing out (due to highly empathetic nature, the family scapegoat responds and gives of herself when the birth family is in need) unknown to me at the time, and the long-held desire to have a strong relationship with my only sibling. I couldn’t be happy living in New York knowing that my brother needed me in Seattle. I am deeply grateful that Amin signed us up for this extraordinary experience — granting us a chance to override the golden child and scapegoat patterns, overcome our individual insecurities, and forge a new relationship together. I am sure whatever you missed in childhood, you will both make up for that now. Really great to see so much progress. I am probably going to talk to my therapist about this…I would be curious to see how this plays out with only children and potential surrogate siblings (such as a parent’s sibling, niece or nephew). I have enjoyed watching both of your journeys through this. Can’t wait to read the next one.